The beautiful in-ground pools we have for our guests at Holiday Barn Pet Resorts are pretty-much open year-round. With Virginia’s fluctuating temperatures, the occasion to swim can come any day, even in the dead of winter! We admit, it feels a little strange when you’re standing in our lobby – in your boots, down coat and earmuffs – and see a bunch of dogs splashing around in the pool as if it were the middle of July! We are often asked how it is that the dogs can stand the cold air and water. Is the pool heated? Is it safe for the dogs to swim in such cold temperatures? Dogs are fearless, aren’t they? If it’s fun, they’re ready for it. If you’ve visited the beach or lake in the winter with your fun-loving lab, chances are he/she was not the least bit intimidated by the cold air or water once they took the plunge. Retrievers and other “water dogs” were born for swimming and will attempt to do so even when we think we’re going to freeze! I am reminded of my neighbor’s yellow lab that insisted on sleeping outside in the snow. He looked like a big snow-covered rock laying in the yard. He loved it! His owner couldn’t get him to come inside until nightfall. If you can lay all day under a blanket of cold, wet, snow, then you can jump into cold water without blinking an eye! A dog’s normal body temperature is between 99.5 – 102.5, whereas our normal body temperature is around 98.6. And when the dog’s activity generates physiological heat – like when they’re excited to go on a swim – that temperature is closer to the higher end. That’s pretty warm. With this level of molecular energy (heat), they are comfortable in much cooler surroundings than we are. Dogs who swim in cold weather should be very fit, hearty, healthy, with good body fat stores and activity levels, and adequate coats. • We do not recommend swimming in cold weather for small dogs, young puppies, or senior dogs. • Dogs who wish to swim when it is cold should have thick or double coats. Thin coated dogs, such as greyhounds, Italian greyhounds, boxers, Dobermans, Rhodesian ridgebacks (etc.) should not swim as their coats are not adequate to keep them warm. • If your dog has any type of health condition, he/she should not be allowed to swim. Dogs with heart conditions, kidney diseases, diabetes, or Cushing’s disease are not able to regulate their body temperatures effectively and should not swim in cold weather/water. • It is also important that your dog is conditioned to cold weather. • Consider the gap in temperature. For example, let’s say it’s spring time and you and your dog are at the lake. It feels nice and the air temperature is 75 degrees! Keep in mind that rivers and streams have not yet had a chance to warm up. Water temperature can still be in the 40’s. The contrast of air temp vs water temp can make swimming outdoors feel like jumping into ice water! • The length of time a dog is allowed to swim in cold weather is a huge factor. Prolonged time spent in cold water can lead to hypothermia. Our swim packages range from 10 minutes to 20 minutes max. These quick hits are not likely to cause problems for a healthy dog. Dogs are notorious for pushing themselves past their limits and there are definitely limits for swimming in cold weather. Even double coated breeds and “water dogs” such as retrievers (labs, Chesapeake Bay, Curly coated, etc. ), some Spaniels, English setters, Newfoundland’s, Portuguese water dogs, and the standard poodle can easily exceed what is considered “safe” cold weather swimming. This is why human supervision is necessary. At Holiday Barn Pet Resorts, we are careful of which dogs can be allowed to swim when it’s cold outside. The dogs are monitored by our Camp or Pet Care staff while in the pool. If we see a guest shivering, perhaps whining, seemingly anxious, or slowing down considerably, we will dry them off with a towel and take them back inside where it is warm. PetMD states* that, “In general, cold weather should not be a problem for most dogs until it falls below 45 degrees”. This “generality” must take all breeds into consideration. A healthy, hearty water dog or double coated dog can be very comfortable in temperatures less than 45. We do not allow a dog to swim at all unless the outdoor temperature exceeds 45 degrees. Hypothermia is basically a dangerous chilling of the body. Mild hypothermia for dogs is when their body temperature falls between 90 – 99 degrees Fahrenheit. Moderate hypothermia is 82 – 90 degrees, and severe hypothermia is any temperature below 82 degrees. 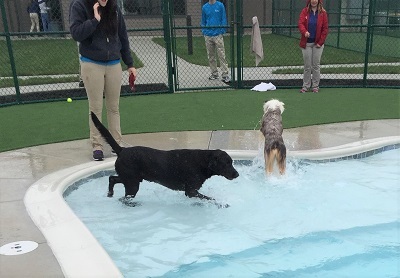 Because of our cold weather restrictions regarding air temperature and time spent swimming, it is improbable that a dog will experience hypothermia while enjoying an invigorating outdoor, cold weather swim at Holiday Barn Pet Resorts. Regardless, we are vigilant in watching for signs. Signs of hypothermia include strong shivering or trembling, acting sleepy and lethargy, stiffness, pale gums, dilated pupils and lack of coordination. To answer your second question, no, the in-ground pools at Holiday Barn Pet Resorts are not heated. Their positioning on our campuses is great for catching the warm afternoon sun, which is a huge advantage. The temperature of unheated, outdoor pools will usually dip a few degrees at night but will maintain something close to the 24 hour average air temperature during the day. The pool reaches its maximum warmth in the afternoon, just in time for our guests to enjoy a fun romp in the water! If you would like for your dog to enjoy a swim package at Holiday Barn Pet Resorts, it would be a good idea to talk to your vet to make sure he/she is healthy enough to take the plunge. Error: Error validating access token: Session has expired on Monday, 29-Oct-18 09:08:51 PDT. The current time is Thursday, 18-Apr-19 19:26:10 PDT.